I've felt pretty in all the pink nail art I've worn to Dewey Goes Pink for the last four Octobers, but this is the first time I actually had the honor of wearing Pink Ribbon Nail Wraps designed specifically for breast cancer awareness! All thanks to Janet Stoy, shown on right. 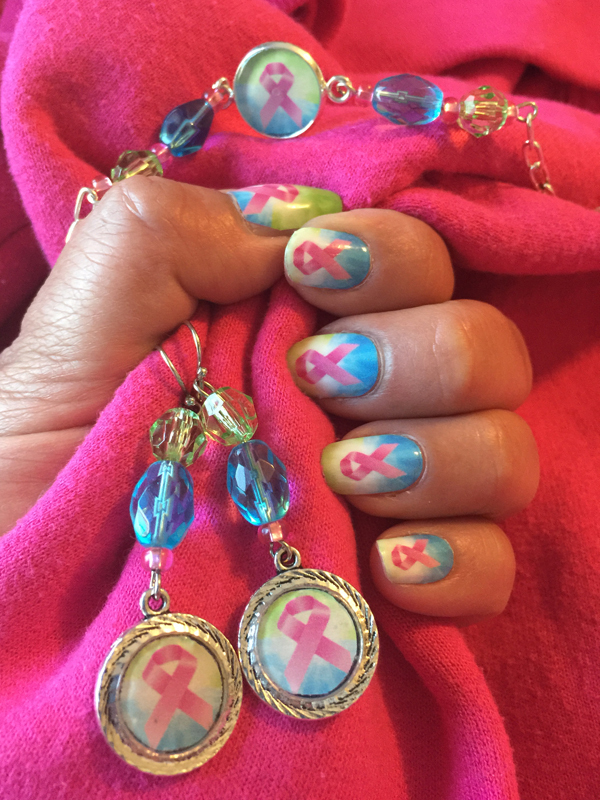 She's a Jamberry Nails consultant who uses Jamberry's nail art studio to create her own custom nail wraps to benefit the Delaware Breast Cancer Coalition (DBCC). Janet contacted me through Facebook after seeing me post about my mom's 5K team, Netty's Nips, which I started in 2013 as a fun way to celebrate her being a breast cancer survivor. For those of you who don't know the story behind my Pink Ribbon Fairy drawing we use as our team avatar, she's based on my mom after the chemo was finally over and her hair started growing back. I was tickled pink when Janet offered to send me a sheet of her Classic Pink design to blog about for Manicure Monday. They arrived with another sweet surprise - the handmade earrings I'm holding to the left! Isn't it clever how she uses leftover nail wraps to create her own jewelry? Her boyfriend's mother, Rena Howard, recently taught Janet how to make jewelry and also donates the proceeds of selling her own creations to DBCC. Rena is a two-time cancer survivor (breast cancer and ovarian cancer) and donates a tremendous amount of her time to DBCC. She has served on the Board, travels from Wilmington, Delaware to Washington, DC lobbying for breast cancer legislation and volunteers at their resale shop Great Stuff in Wilmington. Rena is the inspiration and motivation behind Janet's support of DBCC, just like my mom is mine. After I posted a reminder that this year's Dewey Goes Pink registration was almost sold out, Janet surprised me yet again by signing up to be a member of our team! She's participated before, but never as part of a team. I was fairy honored she chose to join mine and was excited to meet her in person! And nervous, too, as always when meeting someone new. 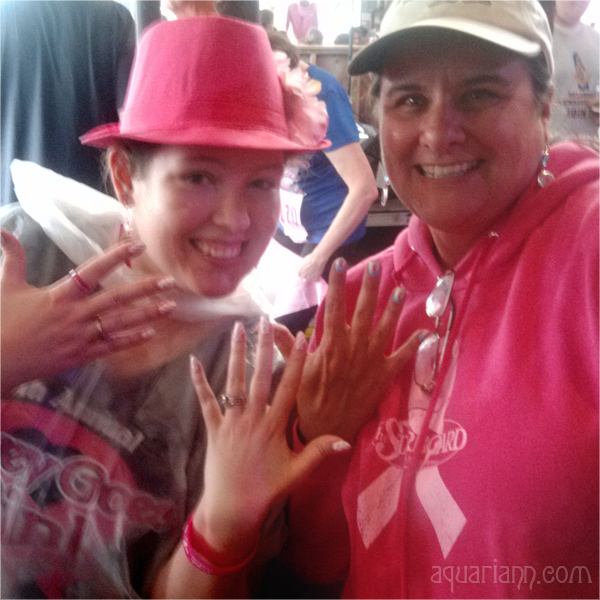 But Janet put me at ease as soon as she introduced herself before the race, wearing the brightly beautiful jewelry and pink ribbon nail art to the left. Then she unveiled even more sweet surprises - a pair of pink ribbon earrings for every woman on our team! She is such a generous soul and I'm thankful our paths crossed. If you want to wear her pretty pink designs for a great cause, follow Janet on Facebook and Instagram to see what she has in stock to buy. So pretty! I love your nails! PS - I really, really like that second set of wraps. I like the blue added in there. Very pretty! 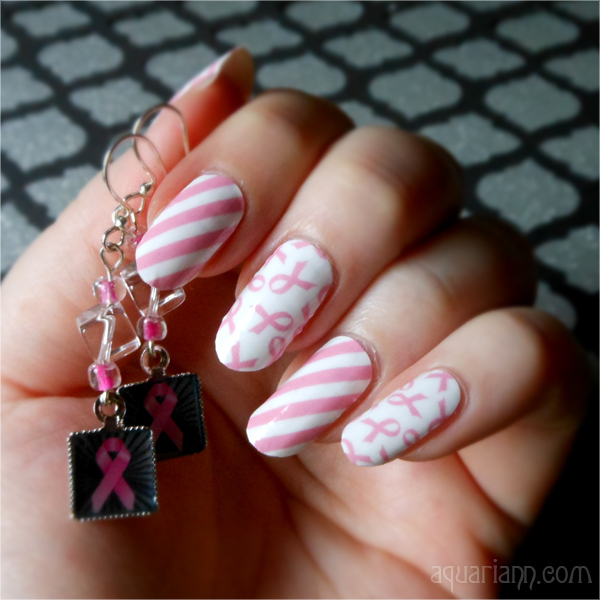 Nice way to show your support for breast cancer awareness. Cute and pretty.